The Southeastern States District Council is a part of the International Association of Bridge, Structural, Ornamental and Reinforcing Iron Workers Union, AFL-CIO. A proud trade association whose beginnings go back to the 1890s. We currently represent 120,000 members in North America. 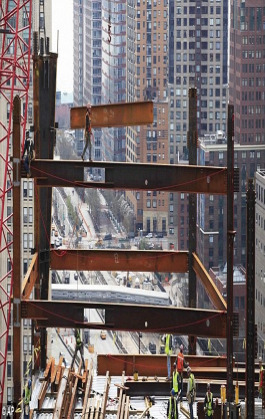 Members of our union have worked on nearly every major construction project you can think of - the Golden Gate Bridge, the Sears Tower, the St. Louis Arch, and the Oil Sands Plant Expansion in Alberta, the World Trade Center, and now Freedom Tower. We represent ironworkers who work on bridges, structural steel, ornamental, architectural, and miscellaneous metals, rebar, and in shops. Across North America, we build. And we build safely and skillfully, getting the job done right and on time. We provide many benefits and support for our members. These benefits include the advantage of working under a collective bargaining agreement that brings bigger paychecks, better health and retirement benefits, more secure jobs, and safe working conditions. Explore our site and find out why for ironworkers the sky's the limit!